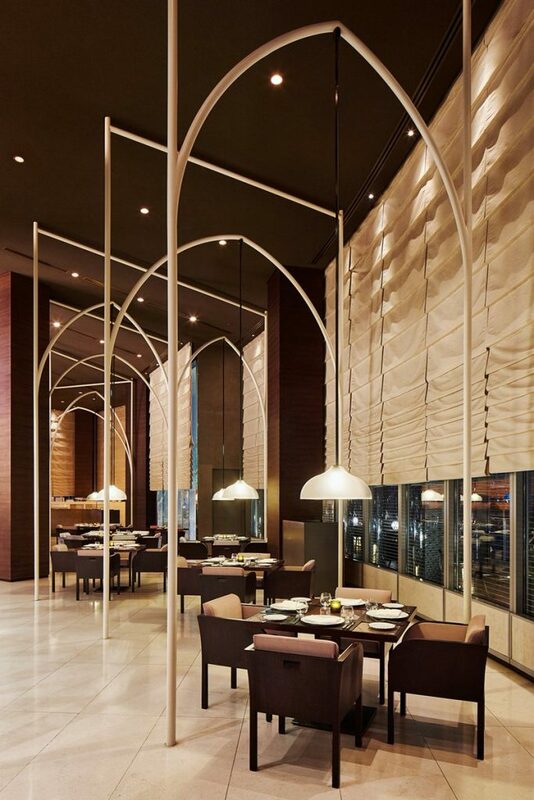 Located in the sumptuous Armani Hotel in the Burj Khalifa, Amal is not just a restaurant it is a dining experience. 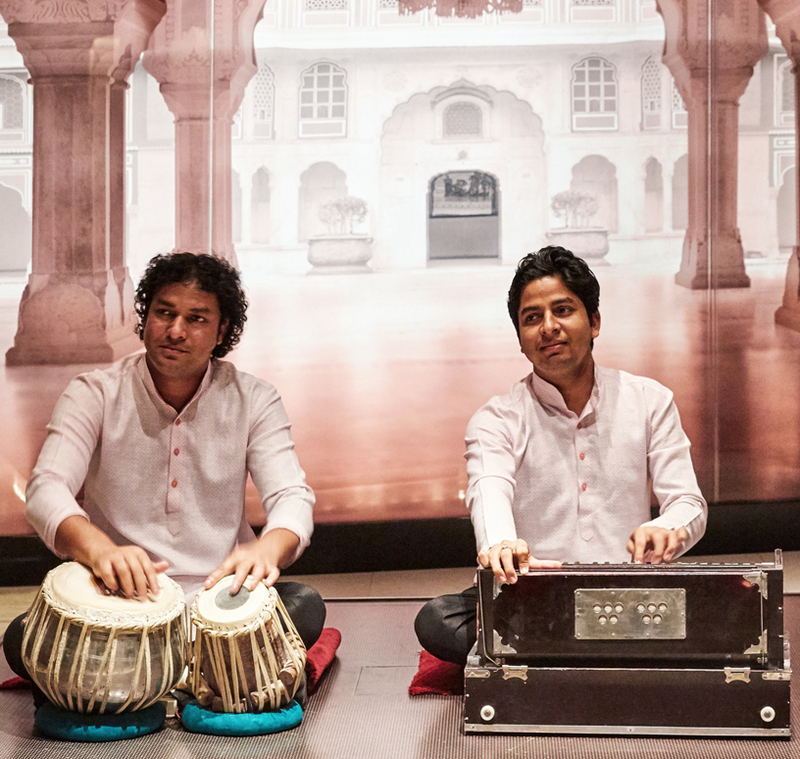 Upon entering the restaurant foyer you are greeted with live Sitar and percussion players and the overwhelming smell of incense, you are instantly transported to India. 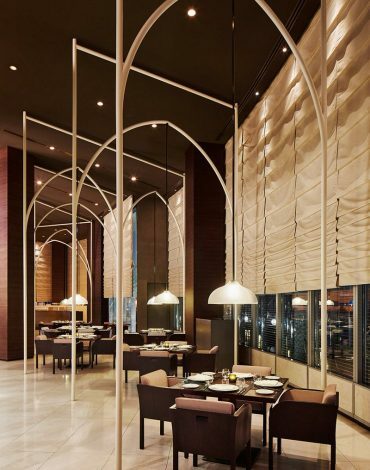 As you step through the restaurant foyer in to the main area you are greeted by large windows over looking the terrace, where we were to be dining, and then inwardly to the open kitchen. 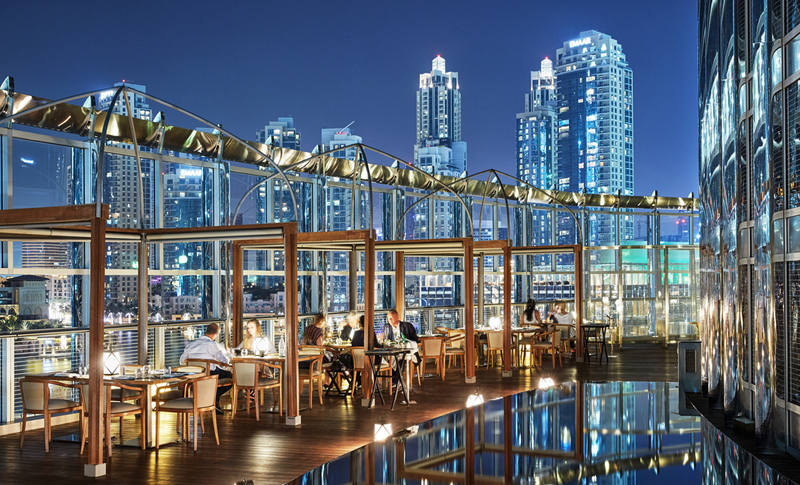 On a balmy spring evening the terrace was just the perfect spot to dine, with a warm breeze and the lights of the Burj Khalifa dancing across the building. Faraz showed us to our table near the terrace edge overlooking the fountains of the plaza; the lights on the floor of the terrace are a little bright so make sure not to look at them directly. We were given the tasting menu that highlights Head Chef Rohit culinary journey from North to South, with all the flavours in-between. We started with Salted Semolina Cake from the Gujarat region, which was soft and moist with tamarind and pineapple, and the Indian staple of poppadums with lentil and black pepper severed with chutneys, the tangy onion being the favourite. The appetizer followed, raw mango flavoured masala black cod with prawn and coriander for Rachel and Sea bream in a South Eastern style for me. Both fish were cooked to perfection, with the cod being buttery and juicy whilst the sea bream was lighter and fresher on the palate. The prawn with the cod had a kick to it with Goan spices and a strong seafood taste whilst the sea bream had lots of curry leaf flavour. We then moved on to the starter of Pepper Chicken and Korean BBQ Chicken. The pepper chicken was medium spiced and served off the bone in a madras style sauce with lots of pepper and curry leaf whilst the Korean BBQ chicken was served on the bone but due to being slow cooked it just slid straight off. The meat was very tender whilst the sauce was sweet, rich and slightly spicy. The chicken dishes were served with saffron yoghurt and cardamom yoghurt to take the edge of the spice, both dips were beautifully fresh and made for a great accompaniment. 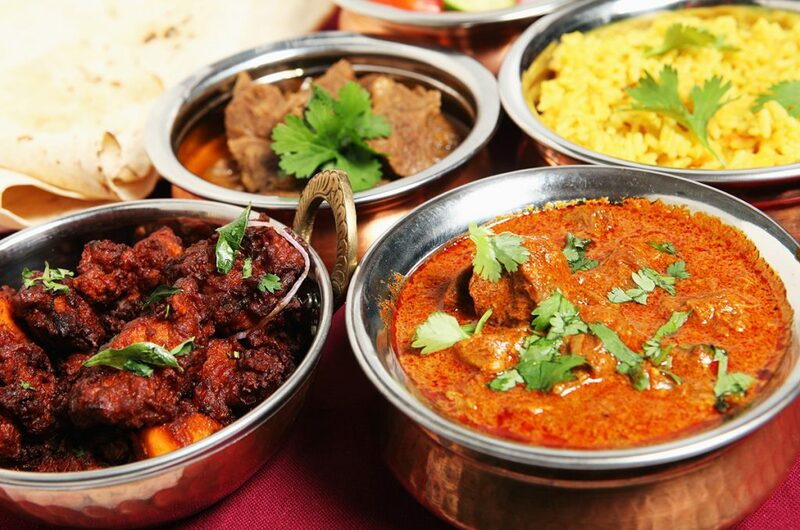 One incredible feature of Amal, other than the world-renowned cuisine, is its position. 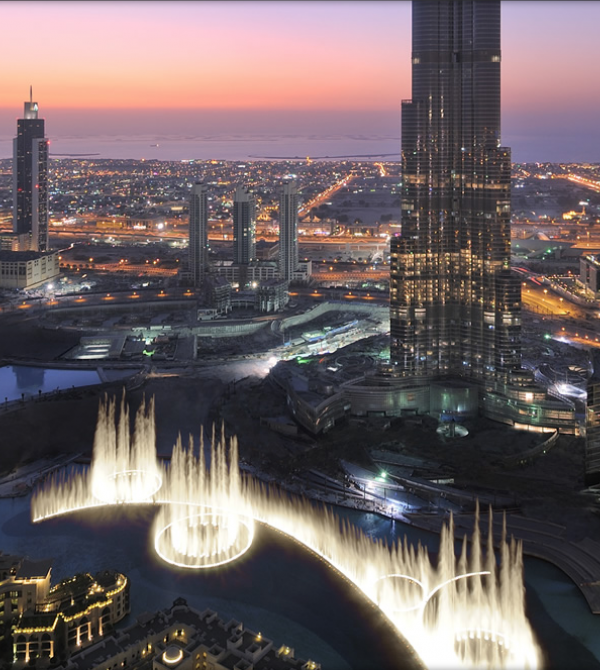 Out on the terrace you will not only be delighted by the food from the kitchen but the incredible show from the Dubai Mall Fountains that are situated below. Every half an hour after 6pm the fountains come alive, through impeccability choreographed lights and water the fountains perform a ballet of sound and vision that stop you in your tracks. Numerous times during the meal one forgets ones food to just gaze at the wonder of the fountains. 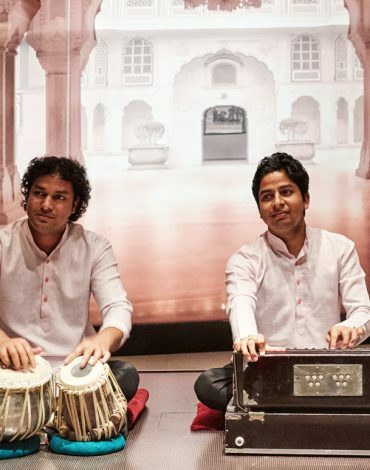 Performances are held daily and last up to 5 minutes; evening shows begin at 6pm and are every half hour until 11pm, and Amal is truly a unique way to experience this Dubai wonder. After the shows of the fountains, from Arabic music to Whitney Huston, it was time for the main dishes. 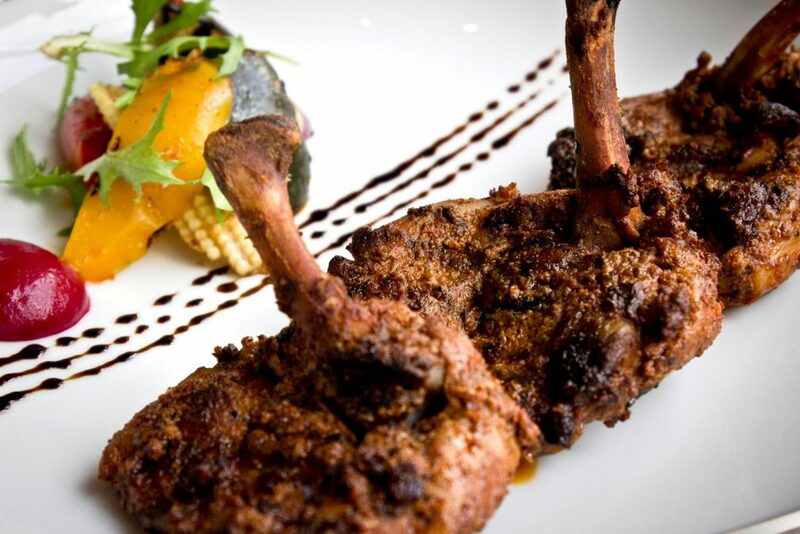 Up first was the Tandoor course of sweet basil flavoured chicken tikka and Tandoor salmon that had been on the menu of Amal since its opening, and we could see why! The salmon was moist and tender, with complex curry flavours that were both savoury and light, whilst the chicken was succulent with a medium spice. Following this course was the Nimboo Lobster with black rice kedgeree, finger lime and coriander bisque; WOW what a dish, the lobster was meaty and juicy but the sauce . . . very spicy which was refreshing to see with lobster, served with black rice that added a savoury flair to the dish. Rachel and I were both impressed by this dish, showing confidence in the kitchen on spice to pair such a powerful sauce with such an iconic shellfish. Last up for the mains was the meat course; Guinea Fowl Banjara with Rajasthani spiced stuffed guinea fowl breast and baby vegetables. The guinea fowl was gamy and unusual with garlic and herby flavours whilst the vegetables were al dente with a crunch. This dish was much more delicate in flavour with the meat doing all the talking, which again was great to see the kitchen play with flavour and spice. Between mains and dessert Rachel and I took a tour of the kitchens with Rohit, the Head Chef of Amal. The kitchens are encased in glass so the interior of the restaurant can see the band of chefs hard at work. Each section has a specific job depending on the oven or cooking style. The kitchen houses two Tandoor ovens, one is a traditional clay pot heated with charcoal, whilst the other is a modern over that can be regulated to exact temperatures. The traditional one is used to make all the bread in the restaurant so as to give it that authentic charcoal flavour. The curry stations are split between meat, seafood and vegetables with many pots on the stove at once, the smell was divine and the fresh herbs and spices on the station show the variety of what goes in to each dish. 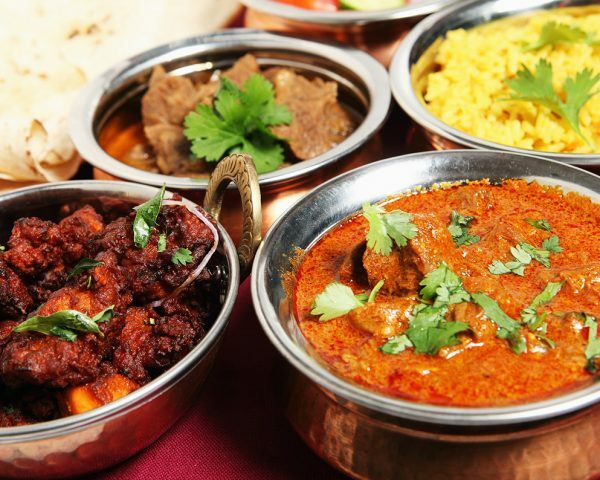 It was a true delight to be able to see the chefs hard at work and the dedication that goes in to each dish from the simple chutneys to the complex curries. Last up was dessert, a chocolate sphere with dark chocolate mouse, walnut sponge and orange ice cream. Usually in Indian restaurants I avoid dessert as it is usually something fried and sticky, but this dessert was a great east meets west fusion. The chocolate is sweet with a mango jelly situated underneath, the orange ice cream is fresh and not overpowering and the walnut cake is nutty and balances the super sweet chocolate. We followed this with a coffee in the knowledge of what was to follow. 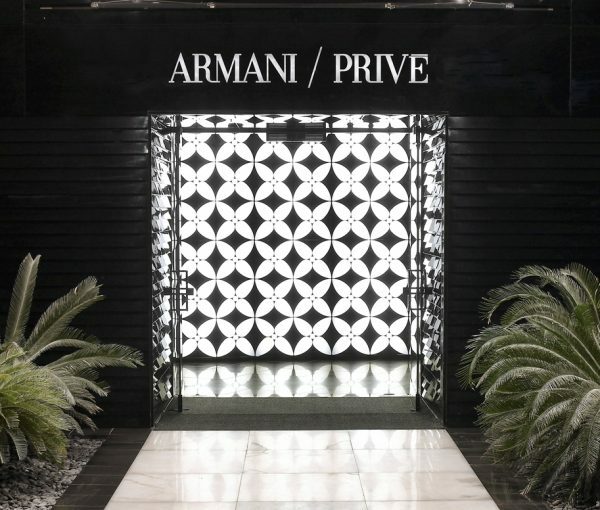 Underneath the Armani Hotel is Armani/Privé, an ultra cool premium nightclub where the glitterati of Dubai come to party. 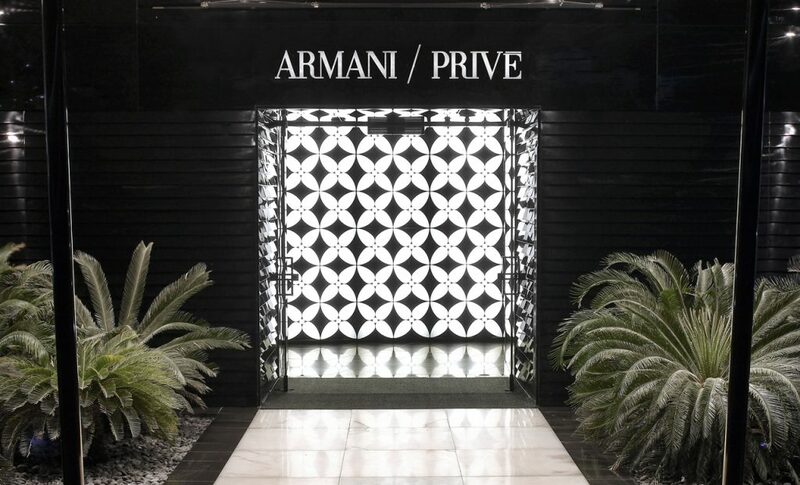 Rachel and I said our goodbyes to the charming staff of Amal and headed down in to the dark of Privé. Through a red roped entrance we were escorted down the ultraviolet stairs and in to the bowels of the Burj Khalifa. Sharp angled tables in white, a bar that jutted out into the dance floor and fluorescent lights greeted us, along with a deafening bass. We were shown to out premium table just one tier from the dance floor and handed champagne (clubs in London take note – THIS is a welcome). We got to the club about midnight, which for Dubai is early, so the club was not yet in full swing but the crowd seemed a classy bunch and the music reminiscent of Ibiza. We took in the atmosphere whilst sipping our champagne and had we not been getting up 5 hours later for a sunrise desert tour I am sure we would have had an epic night. 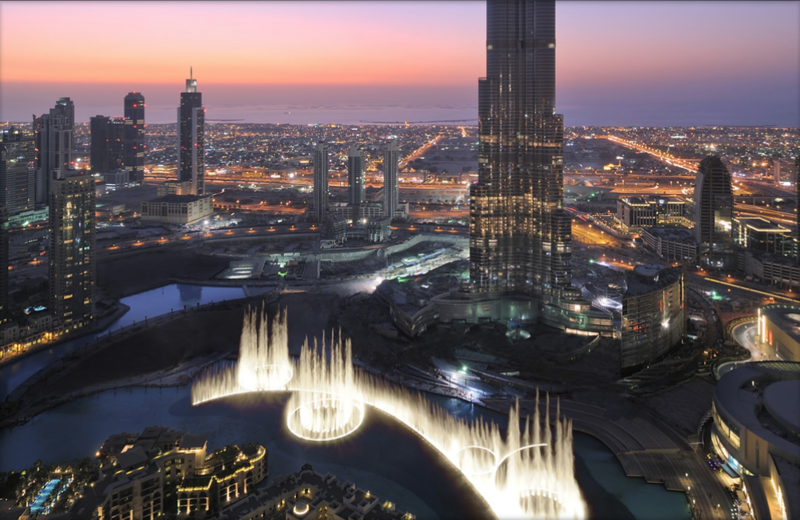 Definitely worth checking out whilst in Dubai if you want to be seen and see whose being seen.